We all have those pattern wish lists, the ones that we saw somewhere but haven’t picked up yet. The Mississippi Avenue Dress has been on my list for years, but if I remember correctly I was still nursing my youngest so I never bought it. 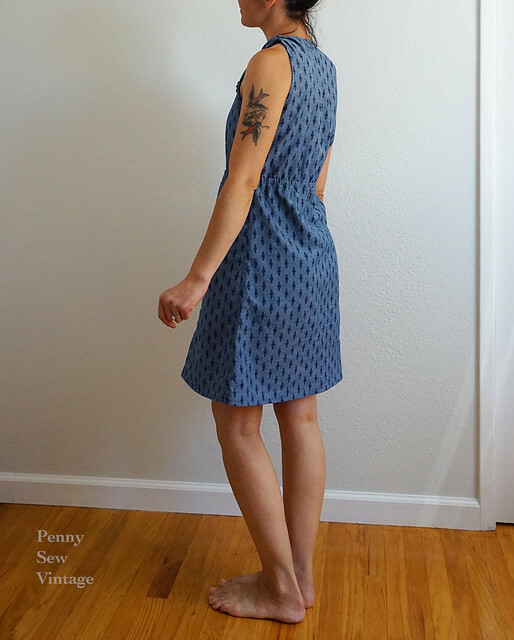 Then I remember stumbling upon Simplicity 8231 while going through the pattern drawers at JoAnn’s, and I was so surprised to see Sew House Seven had their dress available as a Simplicity pattern that I snatched it up. 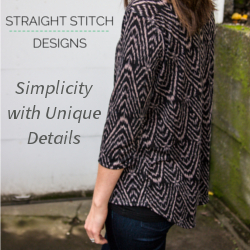 Here’s the info on their blog about it in case you’re interested as the patterns aren’t exactly the same. Well, I saw a beautiful version pop up recently in my Instagram feed and decided it was time to make one! 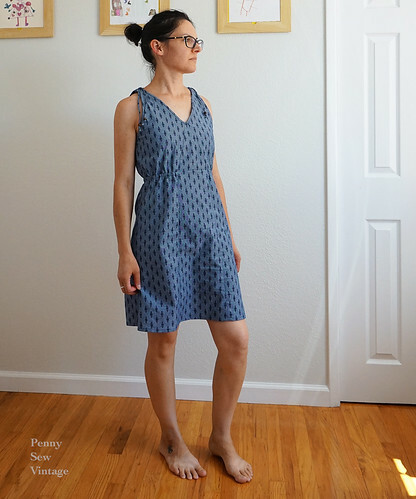 Simplicity 8231 is a misses’ dress that comes with four versions, or really two sleeves (sleeveless with ties or cap) with two lengths (over the knee or midi). It’s meant for lightweight to light/midweight cotton fabric, so I selected a chambray from Cali Fabrics that I had on hand for my first version. My measurements put me into a size 10 for bust, and almost a size 12 for waist/hips, but I decided to go with a straight size 10 for my first version. I also shortened it 4″ (spread evenly between two places on the skirt) since I’m 5’3″. I decided to make version D for my wearable muslin because in a chambray, the over the knee look would be nicer I think. The dress definitely comes together pretty quickly once the pattern and fabric are cut out. I didn’t need to make any alterations at all which is so great, although there was the slight detour when I forgot about the ties and wondered why there was such extreme back armhole gape (I should know better than to fit late at night!). It pleased me how simple the construction was, considering the cute elastic waist feature and v-neckline. 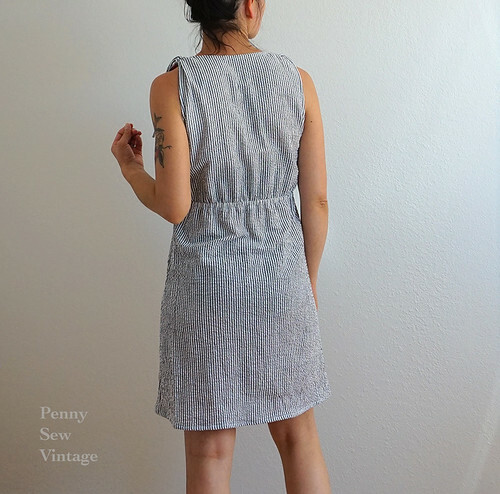 This dress also has no closures, so enormous time saver when putting a fun summer dress together. The only hiccup for me were the ties. I always have trouble turning them since I have like no finger strength. I tried several different ways with these teeny tiny ties, including the thread method in the pattern, but my thread broke in half part way through which required a complete tie do-over. I ended up using 1/8″ satin ribbon which worked well and didn’t break whilst turning, much to my relief. Finally, I tied the ties to make the shoulders 1″ wide which looked best in my size I think. I also used some beads on the ties to spice it up a bit, and I like the added touch. After making my first one so quickly I made a second one in in seersucker. I love seersucker in the summer because it’s just so breezy and makes the hot weather feel almost bearable. It was a very hot day when I took these pictures, so I didn’t take very many, but I wanted to include a shot of the dress head on and this was the best one there was. I think I was playing around with how wide I wanted the shoulders to be. They aren’t really attached yet, just kind of thrown on to get pics before I completely lost all motivation to take pics. I do love playing with stripes though, and the center panel of this dress is a fun place to do this! Here’s the back view, and you can see some of the fabric pooling a little over my bottom. I need to maybe make a sway back adjustment next time and see if that helps (it seems to come and go which is why I’m not sure if I want to make the adjustment). 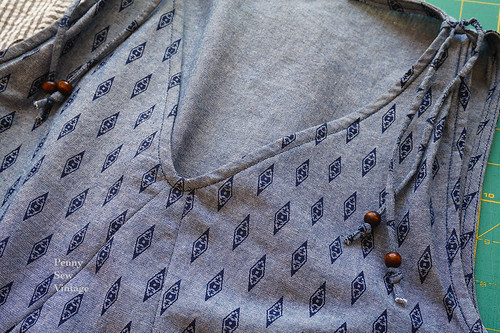 In the seersucker version it’s not so bad, but the chambray dress has a bunch more, possibly because of the weight of the fabric. Also, I’ve worn the chambray version twice without washing (shhhh, it’s been crazy), so maybe there’s that. I’ll have to take another look after washing it. I just love these dresses because they’re pretty quick to sew, look nice enough for a dinner out and casual enough for errands. I’m making the midi length next time with a lightweight calico I think. I just need to find one that’s opaque enough to be made without a liner.